For readers in southern California (if you can stand the heat! 113 degrees in late September! 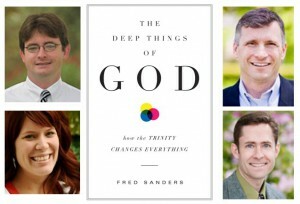 ), come on by the book release event for The Deep Things of God: How the Trinity Changes Everything. Two hours of Trinitarian theology from me and my Biola colleagues Erik Thoennes, Melissa Schubert, and Rob Price. A surreal experience that goes along with book publishing: I keep getting blessed by my own words when I see others twitter them. They sound better to me when I get them back from brothers and sisters in Christ; they gain something in the echo. For example, Jared Wilson tweeted this week: “The gospel is so deep that it not only meets our deepest needs but comes from God’s deepest self,” and Justin Buzzard picked out this one: “Anyone who teaches a grace that is not amazing is teaching something that is not grace.” Man, I wish I’d said that. Oh wait, I did. Weird. The real tragedy, according to Sanders, is that evangelicalism is, ironically, the most trinitarian tradition. The gospel that evangelicals gets right is so, even if it is tacitly, trinitarian! The good news, explains Sanders, is that evangelicals have everything they need to regain a deep trinitarianism. Sanders sets out to help his readers know what they know. He says it this way, “The first step on the way to the heart of the Trinitarian mystery is to recognize that as Christians we find ourselves already deeply involved in the triune life and need only to reflect rightly on this present reality.” He then accomplishes this reflection by taking a step away from modern evangelical thought and showing his readers a big view of the history of evangelicals. Throughout this process, Sanders reveals that this history has its high points of explicit trinitarian proclamation and its low points of trinitarian forgetfulness. Though through it all, there remains an undercurrent of tacit trinitarian understanding. The Deep Things of God takes the reader on a journey through the history of evangelicalism into the Happy Land of the Trinity and back to their individual prayer closets. It’s depth is matched only by it’s breadth, and for this reason it is a must read for every believer who is tired of being told that they must accept the trinity, but not understand it.